How much moon do we see? One side of the moon always faces Earth. Even so, over time, it’s possible to see as much as 59% of the moon’s surface, due to lunar libration. Lunar libration lets us see more than 50% of the moon. Photos by Manuel Castillo Vela/ EPOD. Why can’t we see the moon’s farside? Why can’t we see the moon’s farside? Some people mistakenly think the moon doesn’t rotate on its axis because the same side of the moon always faces Earth. But the moon does rotate. The video above shows why you’d see all sides of the moon if the moon didn’t rotate on its axis. It’s best to watch the video from start to finish. So the moon does rotate. Why, then, do we see only one face of the moon? One side of the moon always faces Earth because of what’s called synchronous rotation. That is, the moon rotates, or spins on its axis, in the same length of time it takes to orbit Earth. Any moon whose rotational period equals its orbital period is said to exhibit synchronous rotation, a characteristic shared by many moons of our solar system. Because of synchronous rotation or tidal locking, our moon rotates on its axis in the same period that it revolves around the Earth: 27.32 days. For that reason, our moon always has one side facing Earth, which we call the moon’s nearside. Meanwhile, the opposite side remains hidden from us, so we refer to it as the moon’s farside. The prominent crater Tycho provides an easy way for us to see libration in latitude. In the photo at right, notice how much farther south of Tycho you can see during a favorable libration. Image via John Chumack (left)/ Frank Barrett (right)/ AstroBob. Lunar libration reveals 59% of the moon’s surface. You can see only 50% of the lunar disk at any one time. 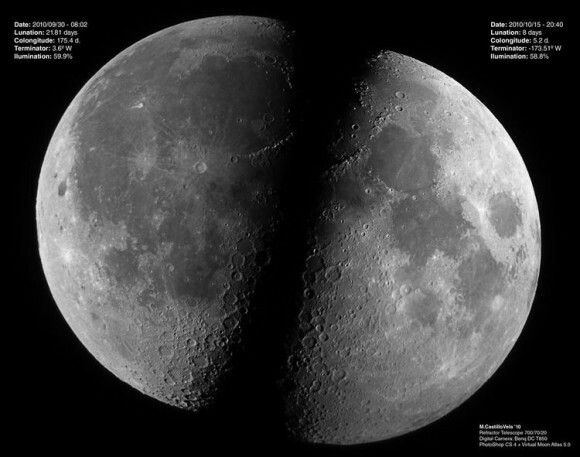 Even so, lunar libration – the slight north-south rocking and east-west wobbling of the moon – enables acute observers to peek at a tiny portion of the moon’s back side. Over time, it’s possible to see as much as 59% of the lunar disk. There are various kinds of lunar libration, the two most notable being libration in longitude and libration in latitude. Before we delve into the subject, look at the moon’s near side on the two charts below. They’ll help to make the arcane nature of lunar libration more understandable! The first sky chart below shows the lunar hemisphere that’s facing Earth when there is no libration in longitude or latitude. The zero point at center = 0o longitude and 0o latitude. The north pole is at top and the south pole at bottom. The line connecting the moon’s north pole with its south pole, and passing through the central point on the lunar disk, depicts the moon’s prime meridian of 0o longitude. Longitude (in red) runs north and south, connecting the lunar poles. The moon’s eastern limb (at right) outlines 90o east longitude. The moon’s western limb (at left) depicts 90o west longitude. The second sky chart below labels the lunar features. Note that east and west on the moon are reversed to east and west in Earth’s sky (celestial east and west). Look at this chart whenever you need a reminder. In this post, we are referring to lunar east and lunar west. Again, we refer to the lunar coordinate map. 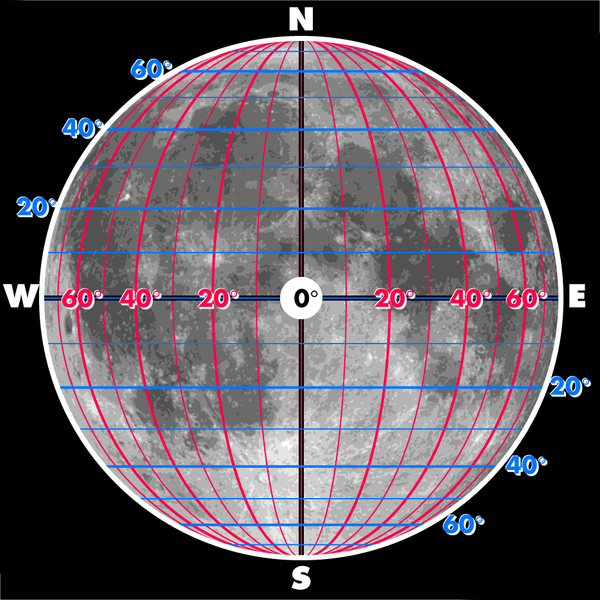 The horizontal line (in blue) from west to east, and passing through the center of the moon’s disk, represents the lunar equator of 0o latitude. The north pole resides at 90o north latitude, and the south pole at 90o south latitude. 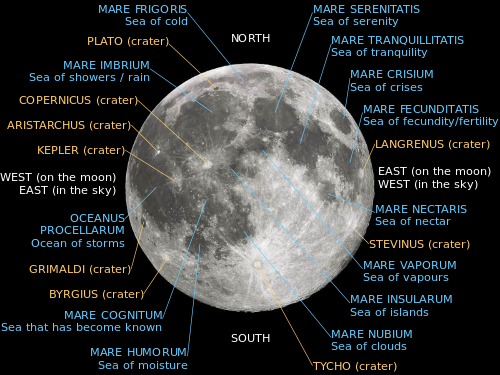 Mare Crisium (Sea of Crisis), labeled on the second chart below, is a well-known lunar “sea” (lava plain) near the moon’s eastern limb. Using the lunar coordinate chart, you may note that 60o east longitude and 20o north latitude pass through Mare Crisium. This lunar coordinate chart shows latitude and longitude on the moon. Libration in longitude. Libration in longitude is the moon’s east-west wobble. This sort of libration is a product of the moon’s elliptical (elongated) orbit. Although the moon’s rotation, or spin, goes at a nearly constant rate, its orbital speed varies, going fastest at perigee (moon’s closest point to Earth) and slowest at apogee (moon’s farthest point from Earth). At perigee or apogee, there is no libration of longitude. Maximum librations are seen about one week after perigee and one week after apogee, revealing (depending upon the month) up to 8o of longitude on the moon’s back side, along the eastern and western limbs, respectively. Following perigee, the moon’s rotation can’t keep pace with its orbit, so a slice of the moon’s back side slips into view along the moon’s east (right) limb; following apogee, the moon’s rotation outpaces its slower orbit, causing a sliver of the moon’s back side to emerge along the west (left) limb. By the way, the near side of the moon (see illustration) rotates from lunar west to lunar east (left to right), whereas the back side spins from right to left. Libration in latitude is the moon’s north-south nodding. It results primarily from the approximate 5o tilt of the moon’s orbital plane with respect to the ecliptic (Earth’s orbital plane). Add to that, the approximate 1.5o tilt of the moon’s equator to the ecliptic, and you have the inclination of the moon’s equator to the plane of its orbit around Earth at some 6.5o (5 + 1.5 = 6.5). Consequently, during the month, you can see about 6.5o of latitude beyond the moon’s north pole, and a fortnight later, 6.5o past the south pole. Twice a month, the moon crosses the ecliptic (Earth’s orbital plane) at points called nodes. 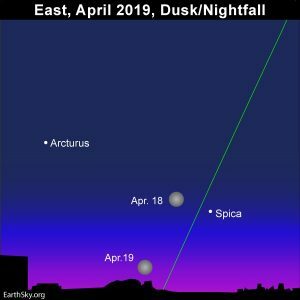 When the moon crosses the ecliptic from south to north, it’s called an ascending node; and when the moon crosses the ecliptic from north to south, it’s called a descending node. There is no libration of latitude when the moon is at its ascending node or descending node. 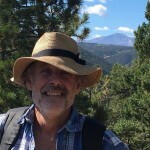 Maximum librations happen about one week after the moon crosses either node. The moon’s southern limb is most exposed about one week after the moon crosses its ascending node, and its northern limb is maximally exposed about one week after the moon crosses its descending node. In other words, when the moon swings farthest north of the ecliptic, the lunar south pole points most toward Earth. On the other hand, when the moon goes farthest south of the ecliptic, it’s the lunar north pole that points maximally toward our planet. At particularly favorable librations, we can see nearly 7o beyond either pole. 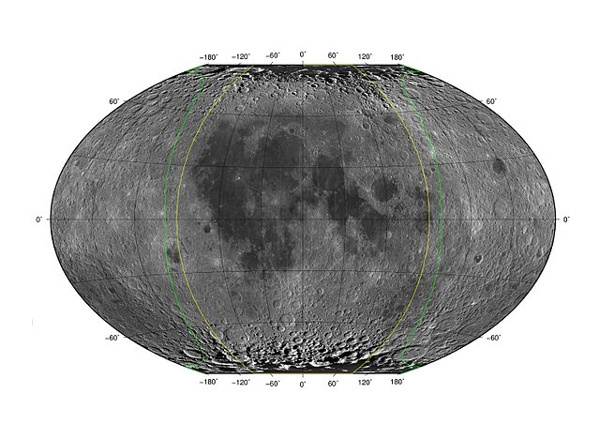 View larger The yellow lines define the near side of the moon, and the space between the yellow and green lines outline the far side of the moon that is visible from Earth, given favorable lunar librations. Other types of lunar libration. Your position on Earth also has some, but significantly less, bearing on latitudinal libration. If you reside at far northern latitudes, you see further north on the moon than does someone in the Southern Hemisphere. Of course, the reverse is also true: someone in the Southern Hemisphere sees more of the moon’s southerly features. Your position also influences longitudinal libration – though once again, rather marginally. At moonrise, you can make out a little more of the moon’s east (or top) limb; and at moonset, a little more of the moon’s west (and now at top) limb. So, as you stand on Earth’s surface, it’s true that you see only 50% of the moon at any one time. And yet, all told, lunar libration – the north-south and east-west oscillations of the moon – reveal 59% of the lunar terrain. Bottom line: Over time, it’s possible to see as much as 59% of the moon’s surface, due to a slight north-south rocking and east-west wobbling of the moon known as lunar libration.